Coney Island Carousel Horse Naming Contest: Cotton Candy vs Ravishing Ruby? This sweet pony, the first restored horse from the B&B Carousell, looks happy to be back in Coney Island! What’s his or her name? That will be up to the popular vote on Facebook. At the moment “Cotton Candy” and “Ravishing Ruby” are the front runners. “Home Sweet Home,” “Thunderbolt,” “Tornado,” and “In Memory of Mike Saltzstein,” who operated the carousel for decades, are some of the other suggested names. There’s also “William,” for the carousel’s builder William F Mangels, and “Marcus,” for Marcus Illions, the carver of the lead horse. This horse, as well as the others, was carved by Charles Carmel. The name “Ravishing Ruby” is being championed by Brooklyn-born actress Annabella Sciorra, who writes on her Facebook page: “They’re looking to name the first restored carousel horse in Coney Island. If you like my page please vote for the name ‘Ravishing Ruby’ after one of my best friends who grew up on the beaches of Coney Island! !” Ravishing Ruby is also the title of a country song from the ’70s! Our guess is that some who are voting for the name are associating it with Coney’s beloved Ruby’s Bar and Grill. “Cotton Candy” is a cute choice, but please be advised if it wins that doesn’t mean you’ll be able to bring actual cotton candy on the ride. Inspired by the creative names of the horses at the Kentucky Derby, which was run yesterday, ATZ’s choice is “Home Sweet Home.” We think it’s the perfect name since this B&B horse is the first to come home to Coney from Ohio, where the carousel has been undergoing restoration, after an absence of seven years. Go, Go, Go, Home Sweet Home! Today is the second and final day of the B&B Carousell Open House presented by the City’s Economic Development Corporation at the Coney Island History Project, where you can get your picture taken with the horse and cast your vote in person. If you live too far away to visit, you can still vote on Facebook to name the horse. The B&B Carousell is also in a very competitive online horse race with 40 historic properties for a share of $3 million from Partners in Preservation. New Yorkers as well as anyone who loves New York may cast one vote daily on the Partners in Preservation New York City website or via Facebook, smartphone or tablet. Congratulations to Dano Panariello, who suggested the name “Ravishing Ruby” in honor of his mother! 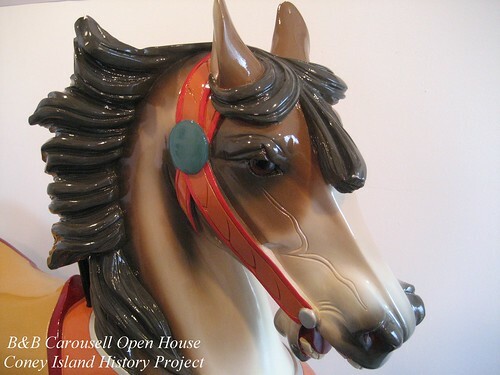 The Open House and the naming contest are over, but everybody please remember to vote for the B&B Carousell every day thru May 21 at Partners in Preservation, where it is in a horse race to win a grant. You’re the best! – Thanks for the background on some of the other entries. I’m hoping with everyone voting for B&B – there’ll soon be a able to use all of them!